Marketing is hard. In fact, marketing is getting harder to grasp for every year, month and day that passes, and yet it’s so easy once you crack the code. When I think about marketing I like going back to basics, and for me that means going back in time. When you think about it, people only started exchanging products and services when they could see a value in having an expert deliver instead of doing the work themselves. “I’ll fix your roof if you put food on my table”, would be a fair exchange. It was all based on trust. As a professional your biggest competitor would most likely be the customer himself. If he didn’t trust you to do a better job than he could do himself, you wouldn’t get the business. Your reputation was everything and no marketing in the world could fix that for you. Why did marketing become important? When people moved to cities it became easier to buy from someone else. Some would choose based on price, others based on quality while for others easy access would be more important. For businesses this was both a threat and an opportunity. The natural thing to do was to expand your market and to think about how to position yourself. As a result product, price, place and promotion, the 4 P’s of marketing, became the paradigm that marketers have been following since. Fast forward to what we’ve been used to see as modern day marketing, a time where image is everything, and the best way to position yourself is to steer the way people think about you. Marketing and PR professionals have done their best throughout the years to shape their companies’ image. The look and feel of the company profile would tell people what to expect. Small changes to the profile could make a big impact. When opinions went south, an appropriate PR campaign or a change in the brand message could turn the tide. As long as a majority of people’s touch points were positive and coherent, the brand image would be fine. Being a marketing professional myself I do my best to understand what the customer wants and how to communicate with him. I love working with words, visuals and relationships to create a brand that people can relate to. The way your staff members think, feel and act becomes the identity of your company. A beautiful campaign can instill pride and enhance the way they feel but it can never fully change the group identity. 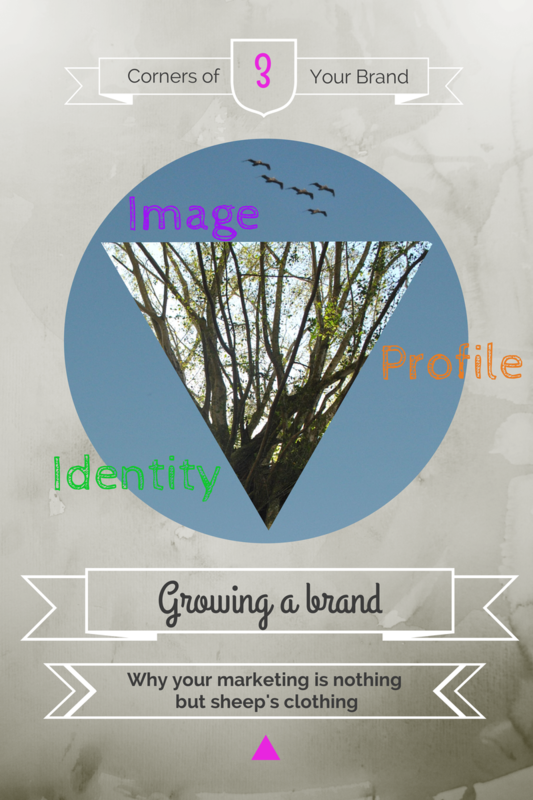 Improving your company’s profile while neglecting its identity is nothing but sheep’s clothing to your brand. Internet has made it possible for anyone to share personal experiences publicly. Employees that aren’t proud of their company will tell others; dissatisfied customers will tell others; everyone with a distinctive experience with your brand, good or bad, will tell others. The time when a message had to be newsworthy or paid for to reach the masses is history. All it takes is one shared experience. That is why everyone’s experience matters, and that is why you as a business owner have to work from the inside out. A new marketing paradigm has emerged, one where who you are matters more than what you do. Your reputation is everything and there is no marketing in the world that can fix that for you. When anyone can tell everyone what they think about you we’re back where we started – a small town community where your actions and relationships are what really matter. Companies that focus all their efforts on profile and none on identity are struggling today. It doesn’t matter what their carefully crafted message says if the internal incentives tell the employees something else. If you ask me, branding today is as much about internal communications as it is about external communications. You need to be who you say you are to meet people’s expectations. To make people talk, you have to exceed expectations. Could it be that good marketing today isn’t about inflated promises but to actually exceed what has been said? I believe established brands have a lot to gain simply by looking at their internal incentives and company culture. If your image is hurting it may be because your employees feel indifferent to what they do. As a start-up on the other hand you need to keep your employees focused and engaged even when your company is growing. Both structure and culture need to incentivize people to do what you say you’re doing. Marketing itself is quite simple. Today you have access to all the tools you could possibly need to make people aware of your existence. For marketing professionals I identify three areas of importance: visibility, credibility and accessibility. Much of this can be done online and should be seen as a great opportunity not a threat. If you’re already doing a good job for your clients then transparency should be your best friend. I’d love to hear what you think. Is marketing getting harder or is it getting easier? What areas of importance have you identified? Please share in the comments. Marketers around the world are doing their best to find bearing in a marketing landscape that is swiftly changing. Marketing used to be a matter of clever tactics based on the best guesswork available and distributed to the right masses. But something has changed. Many marketers would correct me by saying that it’s all about finding the right target groups and not about communicating to the masses. But when you think about it, finding your target groups in the marketing world of the past was equal parts a numbers game as it was an educated guess. You’d figure out where they might be and communicate with as many as possible, and hopefully a few of them would be interested. What does this have to do with small business marketing? Marketing has shifted to the favor of small business tactics and many companies today have a lot to learn from their local one-man shops. The change is rather simple. To reach your target groups you had to invest time and money in mass communication, usually through advertising. You had to know how to construct a message that would speak to its audience swiftly and stay on top of their minds for as long as possible. Not only did this type of marketing communication require a substantial monetary investment, you also had to have the marketing professional’s knowledge and the dedicated time of marketers. For the small business owner it was a daunting task to keep up with the Joneses, one that seldom lead to the expected results. So they were forced to use other tactics. The smaller businesses have traditionally relied on word of mouth marketing for their businesses to thrive. Take care of your customers and they will take care of you. This is something they most often won’t consider marketing, it’s just something you have to do ( and pride yourself to do ). Sole proprietors often equal marketing to advertising – something they’ve never fully believed in. If you ask them what they do to market themselves, a lot of times they’ll say “nothing”. Isn’t it interesting how the awareness of word of mouth marketing, content marketing and inbound marketing has exploded in the marketing world while the true experts are unaware of their own marketing capabilities? No one really cares about that one liner message that targets everyone. It was a way to grab people’s attention in a time when our attention was divided between the people around us, the activities we enjoyed, television, radio, papers and magazines. It is much harder to get through and grab someone’s attention today. Everyone is communicating with everyone. Not only do we spend time with people around us, we spend time with people all over the world. We don’t just read about celebrities in magazines, we follow them daily online. The competition for people’s attention is extreme and the least interesting message is the one about your product. And yes, that includes the updates of what their friends had for lunch. Most people won’t care about what you do. A lot of people will even think that you are annoying and disrupting. Trust me, you don’t want to become known as the company that keeps spamming. Instead of focusing on numbers you need to focus on that one person in front of you. That one person visiting your website right now or that customer knocking on your door to ask a question. You don’t need thousands of impressions or visits, you don’t need followers and page likes. You need to wow one person and one person only – the person who decided to reach out to you. Let others speak for you, that is your best chance of grabbing the attention of your target groups. If you make one customer thrilled it may be more valuable for your marketing efforts than 10.000 impressions. I believe that there is more to be learned from the smaller businesses than from the world’s biggest enterprises. How do you thrill one customer at a time? How do you maintain a customer relationship for a lifetime? How do you get brand ambassadors that keep referring new business to you? In short, how do you get others to talk about you? What have worked for you? Have you heard of any great examples of how to engage customers and followers? I’d love to hear about your experiences. I’m sorry if I have put you through the hassle of copy pasting my website into Google translate. When I first arrived here about a month ago I didn’t put much thought into how my own online presence would have to change in order for me to reach out to people. My page has remained Swedish with a naive thought that most people wouldn’t read it anyway. Besides, most of my time has been spent talking to inspiring and creative people in the Bay Area which I would qualify as a valid excuse if anything. Anyway, today I finally came to the conclusion that for someone who prides herself in knowing how to communicate well it’s simply not good enough. My traffic from the States has increased throughout the weeks and it wouldn’t be fair not to offer some kind of site to visit. It can be hard enough to remember the owner of that business card you’re holding in your hand. Here it is, my tiny window for you to peek in through. It’s not quite as informative as the Swedish site, but it is a place to visit when you need to double check something. So no more need for Google Translate, at least not here. With a passion for communication and technology, and a curiosity for anything unknown, Katarina thrives when she gets to study the latest ideas and learn from the thought leaders of the past and the present. Small business marketing and professional online presence are some of the areas she educates others in. Katarina is writing a book about marketing for the small business owner. Inspiring stories, innovative solutions and creative ideas are welcomed.